Universities’ football programs are bringing in more money than ever. Then why has attendance declined in nine of the past 10 years? According to Whitney Wagoner, director of the UO’s Warsaw Sports Marketing Center, the answer is simple: Watching the game on television is getting to be more pleasant than actually attending. This has complicated universities’ recent push to sell more tickets to young, recent graduates. By reaching a younger crowd, they are able to lock down sales for years to come. But still, they are seeing people more willing to stay home. For more, see “Universities turn focus to young fans as football attendance declines” in the Pittsburgh Post-Gazette. 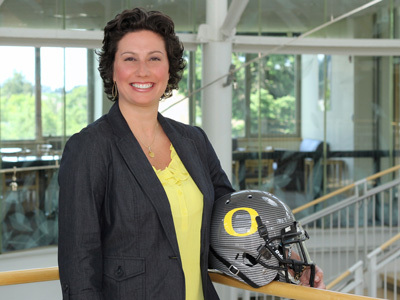 Wagoner, who graduated from the UO in 1996, spent seven years in corporate marketing positions with the NFL in New York City before returning to teach business courses at the Warsaw Sports Marketing Center in 2003.